Read the Year End Summary of Organizing Fellows, Tony Ngala and James Njoroge. James and Tony are running a campaign in Kanyerere to mobilize parents involvement in their children’s education. Part 1 Found Here. The truth is all this activities happening in this sub-location and its neighborhoods are really helpful and indeed they have helped many people in the community but having a look at the community, it’s still the same, same challenges same cycle being repeated over and over, the community continues to drawn in the ocean of dependency and strongly believe they need someone to come and fix their problems for them, they actually cannot do it because they do not have the resources, Money, skills and Support. Organizers get into the community and have one on ones with different people in Kanyerere all getting their views on how they see child poverty in Kanyerere and the stories they share are heart breaking. We met parents one on one shared our experiences, build relationships and called community info session, all having conversation to get to the root cause of all these challenges our children are facing. From our work in the community it is evident that the community knows its challenges better and knows how what needs to be done in order to get to the change they want to see, there the idea of bringing projects in the community does not work out as compared to getting the community together although the process of identifying the challenge, developing leaders who are chosen by the community and lastly coming up with an initiative that addresses child poverty. Read the Year End Summary of Organizing Fellows, Tony Ngala and James Njoroge. James and Tony are running a campaign in Kanyerere to mobilize parents involvement in their children’s education. We have been running a campaign in Kanyerere which is a sub location of the Nkaimurunya ward, Kajiado North constituency, Kajiado County. When you take a walk in Kanyerere at during the day you will see children who are walking around collecting plastics containers and scrap metal, others are seated in groups smoking cigarettes or bhang, others have not yet joined school despite them having attained the right age for preschool, others are on the malls asking for food, money and any concerned person would try to fix the challenge either by giving the small children money to buy food or turn the off by telling them “enda shule ukasome, masomo in ya bure” which means “go to school and study , education is for free”. We (organizers) have heard that over and over again. We take a brave step of meeting parents at Kanyerere on what is happening in this community, why is this happening? Kanyerere is composed of people from different communities all over Kenya which makes it difficult for them to work together since some of them are tribal. The leadership Structure of the community is dormant and is influenced by key stakeholders who get people they want into the leadership of the community. Most people in Kanyerere are not employed they depend mainly on manual labor done by the man and male youths and vegetable shops which is mostly done by the women and female youth. We also have local brews (Changaa, Muratina, karovo etc.) where most men and some women after coming from work go into the places and spend all money they had and end up going home without money to buy food or even buy books for their children, and a continuous abuse of alcohol leads to drug addiction. Keep reading Friday to learn how Tony and James overcame these challenges. David Oyaga, Tatua Community Organizer in Ngando, reflect on what he’s learned about setting goals. One of the biggest struggles I see in small community based organizations is an inability to set clear goals in their work. This means that they don’t know when they are successful. As a community organizer I am working to help our Leadership Team in Ngango focus on our clear goal of setting up a cell groups to identify ways the local community can work together so that kids to get back into school this year. 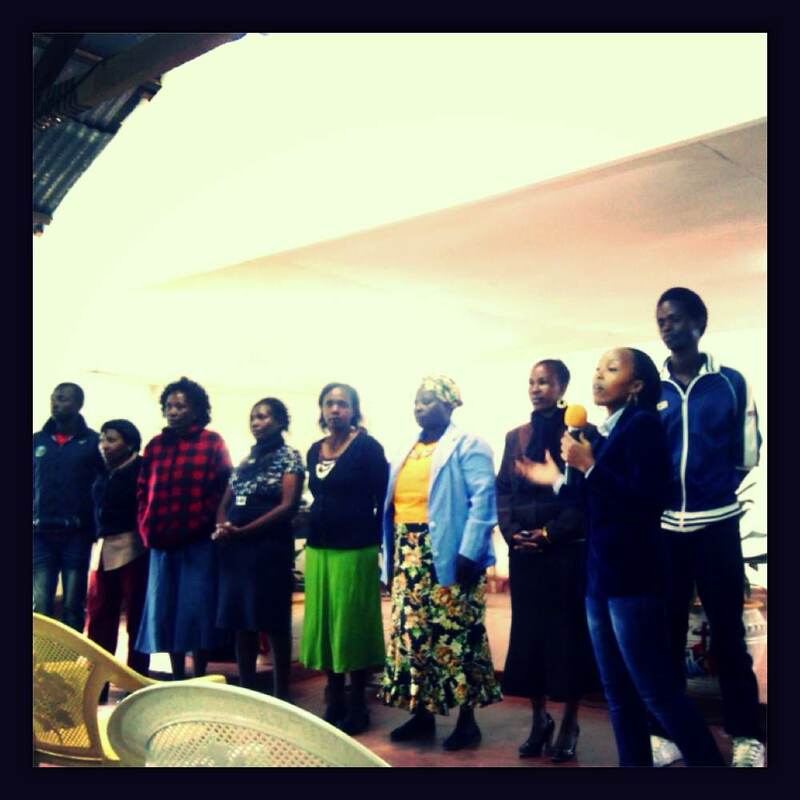 Report from the field by Liz Njeri – Tatua Organizer working in Ngando. At the Ngando Launch, held on the 7th of September, the leadership team was responsible for the majority of the work. The team members organised the event, did most of the speaking for the team and managed the logistics. Natalie brought two people interested in learning about Tatua Kenya to the event and it was great to show them how the leadership team had taken responsibility to run the campaign – it wasn’t just Tatua Organizers! Right now we have 239 people who have joined our movement – it’s so good to see organising in action.